Black rats are a rodent which was most likely introduced to North America by early European settlers and explorers in the middle of the 16th century. They are also known as “roof rat”, “ship rat”, “house rat”, “Alexandrine rat”, and “old English rat”. Regardless of the name, they have smooth black or brown fur, and are about 40 centimetres long, and have earned some notoriety as carriers of serious diseases. Black rats are able to carry a number of pathogens. Some of the most well known of which are the bubonic plague, typhus, Weil’s disease, toxoplasmosis, and trichinosis. The can also damage and contaminate food as with their waste as well as the parasites which they carry. Rats can cause electrical fires by chewing through wiring and insulation and causing a short circuit, a habit which may be responsible for as much as 50% of farm fires. They prefer damp environments and will enlarge gaps in the walls and foundations, plumbing, attics, siding. Black rats are common to coastal communities and seaports in Canada. Unlike the house mouse, they exhibit neophobic behaviour, which means they avoid unfamiliar objects and situations. They have an excellent sense of hearing, smell, touch, and taste, but poor eyesight. 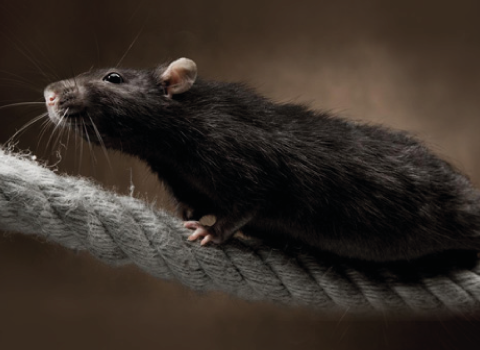 Black rats are excellent at running and climbing, and prefer to make their in higher locations such as trees and the upper parts of structures. However, they will also burrow in dense vegetation. Black rats will travel long distances from its harbourage, as much as 90 metres, to find food and water. They are omnivorous creatures but prefer fruits, vegetables, nuts and cereals. They pose a threat to natural habitats because they feed on many of the native birds and insects. Black rats are also a threat to farmers because they devour a variety of crops; cereals, sugar cane, coconuts, cocoa, oranges, and coffee beans. If that wasn’t enough, they will also feed on any meal provided for cows, swine, chickens, cats, and dogs. Although their litters are small, these pests are prolific breeders, females can give birth to as many as 40 offspring each year. · droppings are approximately 12.5 millimetres in length and spindle shaped, with pointed ends.